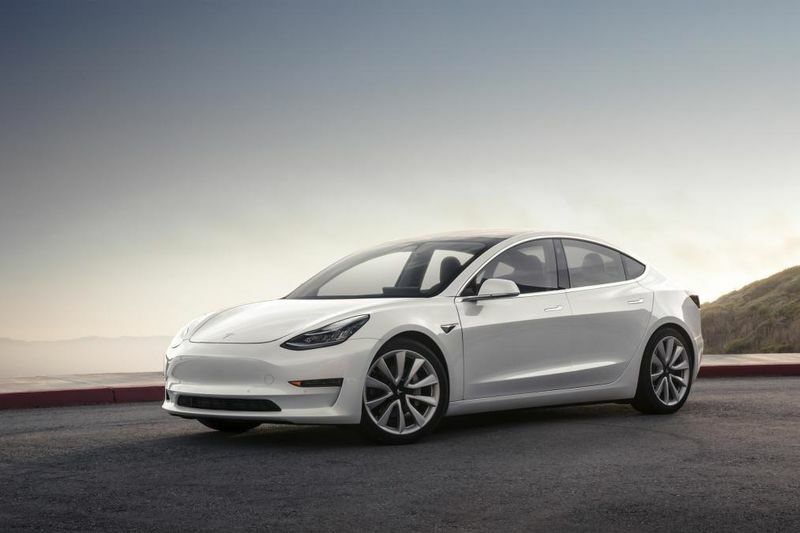 New range-topping Model 3s announced by CEO Elon Musk as production numbers ramp up significantly. Musk has taken to Twitter to confirm the prices and specifications for a pair of new dual-motor variants of the Model 3. As well as the BMW M3-baiting performance version, Musk revealed details of the standard all-wheel drive option. With a motor powering each axle – one optimised for range, the other for power – it is claimed to cover 0-100km/h in 4.5 seconds, 0.6 seconds below the time of the fastest rear-driven Model 3. Top speed is 226km/h. Battery capacity remains the same at approximately 75kWh, as does the projected 310-mile range. Tesla’s semi-autonomous Autopilot tech will be offered as a cost option. Musk stated that the dual motor Model 3 will cost $5,000 more than the rear-wheel-drive Model 3 – so expect a price of around $49,000 in its home market. These details were made public following some long-awaited positive news on the production front. Reports suggest that Tesla has slashed its delivery predictions for the Model 3, revising the wait for US rear-wheel drive Model 3s to between four and six months. Production numbers for the Model 3 are currently believed to be in the region of 500 units per day, with a target of 5,000 per week slated for the end of June. Tesla claims it will further increase that figure to a run rate of 10,000 Model 3s a week as production ramps up further. It's a sharp turnaround from what, in last October, the Tesla founder described as “production hell,” citing welding issues as a factor in the Model 3's missed production target. Aluminium is used for most Teslas, but the Model 3 is mainly made with steel, which could have been a factor for the slow production. Tesla’s third-quarter financial results in November 2017 showed the company made just 260 entry-level Model 3s from July to September. Production was halted between 20 and 24 February, as engineers and factory staff worked to clear bottlenecks. The company admitted it had paused production of the Model 3 – for which it has over half a million orders – but said doing so was “not unusual” when factories increased manufacturing rates. Due to increased production of the Model S and Model X, Tesla posted net losses of $619 million in the three months leading up to 30 September, nearly doubling its Q2 losses. During Q3 last year, they made profits of $21.9 million. In 2006, Musk published a ’top secret masterplan’ on Tesla’s website. It was low on detail but the groundbreaking electric car company has stuck to it. Tesla, it said, was going to ‘create a low volume sports car, use that money to develop a medium volume car at a lower price and use that money to create an affordable, high volume car’. The Tesla Model 3 is that ‘affordable, high volume car’. It joins the current Tesla range alongside the Model S executive saloon and the Model X SUV and it’s been launched to an audience of Tesla employees and customers at a special event held outside the Tesla factory at Fremont, California. The first 30 customers collected their Tesla Model 3s at the event with Musk revealing that 50 cars had been built so far. The Tesla Model 3 is a little bit wider and longer than a BMW 3 Series with a 4,694mm length and 1,849mm width. It’s 1,443mm tall and has a long wheelbase of 2,875mm (the 3 Series’ is 2,810mm) to help maximise interior space. Most surprising though is the weight, Tesla claims a kerb weight of 1,610kg that compares well with the 1,475kg of a BMW 3 Series considering the batteries the Tesla needs to haul about. That weight is distributed with 47 percent over the front axle and 53 percent over the rear wheels that deploy the power. All Model 3s are rear-wheel drive from launch but a 4x4 dual-motor version is said to be in the pipeline. There’s a variable, speed sensitive power steering set-up and the suspension system uses double wishbones at the front with an independent multi-link arrangement at the rear end. The curving roofline helps the Model 3 achieve an impressive 0.23 drag coefficient but not at the expense of passenger space. The 5-seat interior has decent leg and headroom but not on the level of the larger Model S and X. In the two luggage compartments, one front and one rear, there’s a total of 425 litres of space. It’s quite a bit less than the 480-litre a 3 Series can get in its boot but there are 60/40 split rear seats to help fit larger loads inside. In terms of exterior design, little has changed compared to the pre-production Tesla Model 3 revealed in March 2016. The Model 3 adopts a more conventional hatchback body but retains the sleek sloping roofline Teslas has become known for. A larger glasshouse than that seen on the bigger Model S creates a higher roofline, while the sunken bonnet gives it a very distinct profile. Appearance-wise, it's no surprise that the Model 3 looks like a downsized Model S. With electrical gear taking up so little space, downsizing the Model 3 was mostly a matter of shrinking the ends of the car and shifting the front seats forward to provide more rear-seat room. Like other Teslas, the Model 3 offers two boots, front and rear. The Model 3 has no grille, save for a small scoop at the bottom edge of the bumper. While this is no doubt good for aerodynamics, it gives the car a rather unfinished look when seen from the front, although the facelifted Model S and Model X both now have a similar look. The Model 3's interior is incredibly simple in its design. Musk explained that the design team "aim for a very simple clean design because in the future the cars will be increasingly autonomous. You won’t really need to look at an instrument panel all that often, you’ll be able to do what you want." A new three-spoke steering wheel is found on the production car and the dashboard is still sparse, with just a 15.4-inch landscape infotainment screen mounted centrally. Speed and gear selection are displayed in the upper corner of the screen, with a strip of climate controls at the bottom. The rest of the screen real estate is split between the map display and stereo controls. Unlike other Tesla models, that's it for instrumentation – in fact, that's it for anything. Aside from a small squared-off steering wheel, the dash is nothing more than an unadorned strip of black and white, with a centre console bisecting the front bucket seats. It's the kind of interior we expect to see in a concept car, but Musk has confirmed this is very close to the production version – it'll remain bare and operated through the central display. The Model 3's rear window extends right up over the roof to the car's B-pillars, while a large sunroof over the front seats completes the illusion of a nearly-all-glass roof. The glass roof also improves rear-seat headroom, and the front seats have been pushed forward for more legroom. The six-footers riding in the back get legroom that’s acceptable and headroom surprisingly generous. Tesla's smallest car won't come with free Tesla Supercharger access either – the company is ending the practice of allowing new customers to top up for nothing at the stations. Model S and X owners will get Supercharger credits, but any freebies for Model 3 owners look unlikely.